Recently I spied this amazing object on Agzy’s page. It’s a pocket shrine to the North and South character John Thornton, as embodied by Richard Armitage. These little shrines are the brainchild of Guylty, who is nothing if not devoted to Mr. Armitage. And why not? Guylty’s other fabulous creations include a full-blown table-top shrine celebrating the charms of the Beauteous Richard. Saint John the Divine. Click for source. I found this shrine fascinating as a piece of folk art, especially because I collect pocket shrines and devotional objects from various religious traditions. 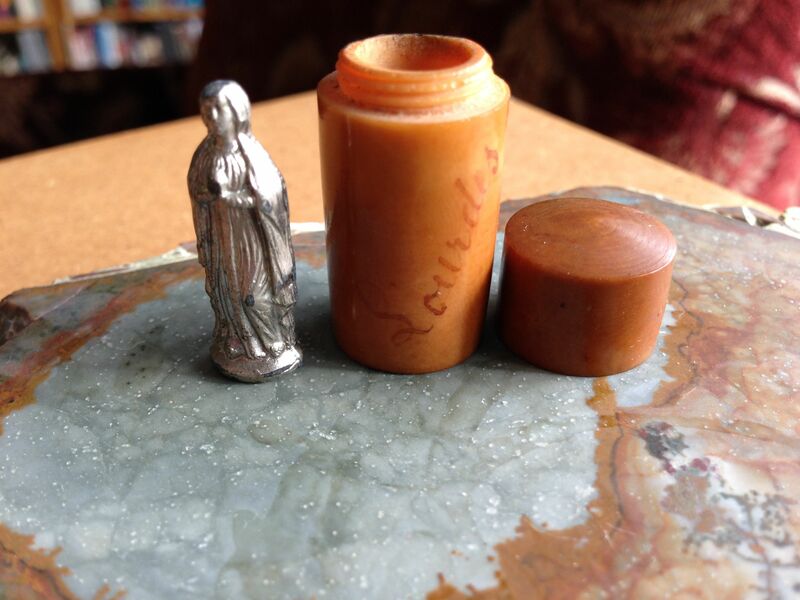 Most of mine are Catholic, but every tradition has its talismans, small portable objects with magical, sacramental, or other special properties. We keep them close by us to provide hope and encouragement through difficult times, and to bring good luck. 1-inch statue of the Virgin Mary from Lourdes. The vintage case is carved from vegetable ivory. 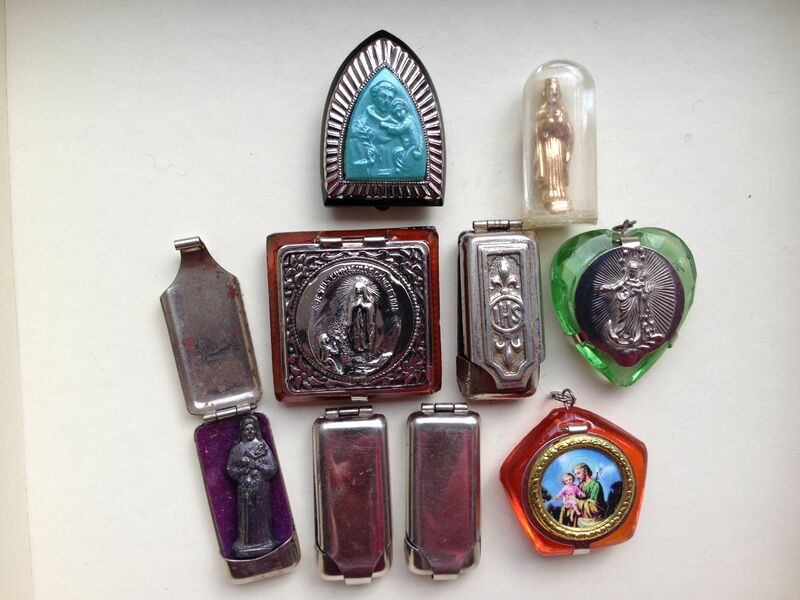 These little cases with statues were popular among Catholics during the nineteenth and twentieth centuries. They usually come from famous pilgrimage sites, and are carried by the faithful in a pocket or purse. They were taken into battle by soldiers, and the cases were sometimes hand-fashioned from bullet cartridges. They have been recovered from Civil War battlefields in the US. 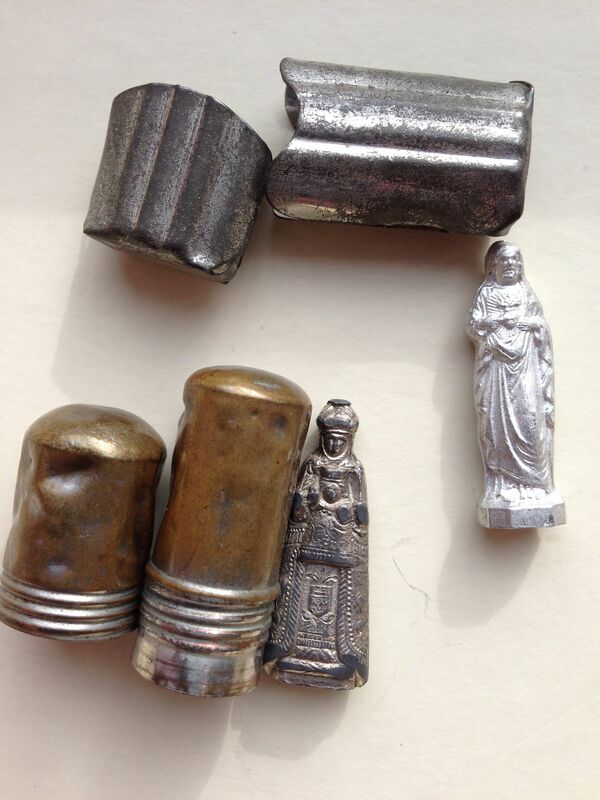 Metal cases holding an aluminum Jesus of the Sacred Heart, and a Virgin with child (Mariazell? ), made of lead. These probably date from WWII. Some pocket shrines come in the form of wallets or flat cases. Mexican examples, like this one, are very colorful. A Mexican wallet shrine with sacred images and medals. Click for source: Drawpilgrim. Another type incorporates a medal in a small leather sleeve. 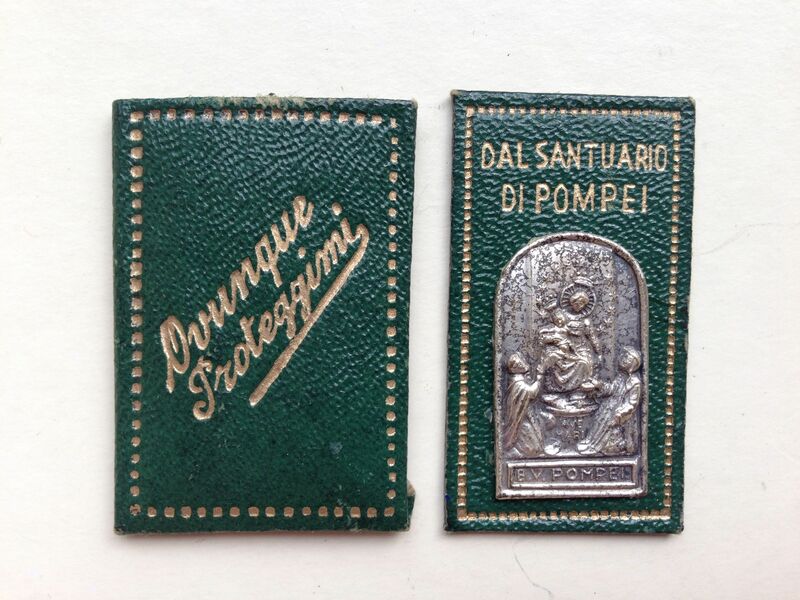 “Protect everywhere.” The image is of the Virgin of Pompeii, where a miraculous painting has drawn pilgrims since the mid-nineteenth century. The shrine of Mariazell in Austria is one of the most popular pilgrimage churches in Europe. The spot has been a shrine to the Virgin since the 12th century. 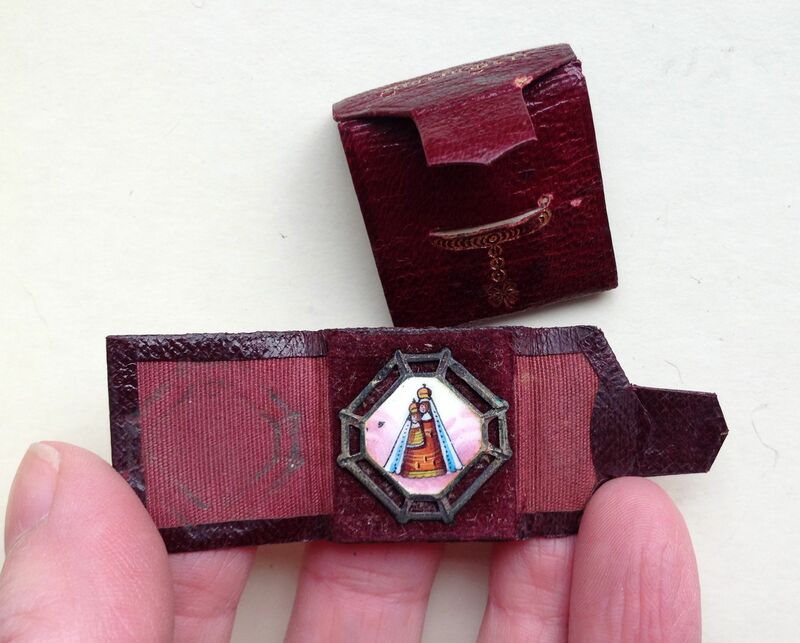 This vintage wallet-style shrine has a hand-painted image of the Virgin. Click to enlarge. Shrines of various shapes. Some contain statues of saints, and some enclose miniature rosaries. In non-iconic traditions, like Islam, pocket shrines may take the form of the written word. 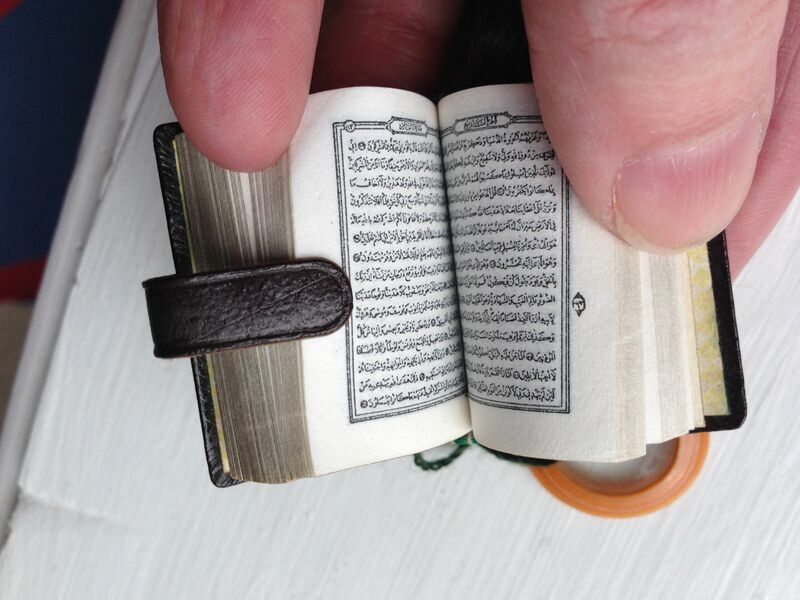 Miniature Korans like this one have long been carried as talismans, and can be read with the help of a magnifying glass. Some pocket shrines are personal in nature. Any object of adoration, be it a lover, a child, or someone we admire from afar, may serve equally well as a talisman. Each of us has a personal pantheon and mythology. “Pocket shrines” include wallet photos, lockets, portrait miniatures or other keepsakes worn or carried on one’s person. Consider this amazing male eye miniature, painted in 1905. From the looks of the eye, its owner was a man of unusual Beauty, able to inspire adoration in a female heart. As a matter of fact, he looks a bit like Richard Armitage! From Cathy Gordon’s photographic archive of eye miniatures and other jewelry. Click for source. Next time: More talismanic jewelry! This is really fascinating, Linnet! I know you had mentioned your pocket shrine collection before, but I had no idea they took so many different, interesting shapes. I love the little Mexican wallet-style shrine (probably because it is so colourful – and because it would be easily replicable – maybe a Mexican style RA, all rolled up like a burrito??? ;-)) Thank you for the shout-out (btw, if you want to use a pic of my shrines, feel free to do so). I will link back to this really useful post on the next RA pocket shrine post. Oh, and that last shrine, the picture of the eye: I totally agree with you. Before reading the text I was convinced it was a picture of RA’s eye! PS: Shall I count your linkback as an entry to the giveaway I am having at the mo? Or is it blasphemous to potentially add one of my shrines to your religious collection? And by the way, yes, the Mexican ones are beautiful. I like that they are so complex, with many interlocking elements in different materials, rather like your own creations! Your tabletop shrine looks very much like Mexican ones I have seen–I assumed it was inspired by them. Love this post, a super interesting read. Thanks. Thanks! BTW the penny finally dropped last night about the Silly Yak’s name. I can’t believe it took me so long to figure it out. It was something the kids and I came up with just after he was diagnosed, afterwards, we found out there were gluten free products called ‘Silly Yak!’. And we thought we had thought of it first! My best friend is a Silly Yak too. I’ll have to ask her if she’s ever seen those products! Why has Apple not yet come out with the iPray, I wonder…! Great post Linnet. I think that last one looks a lot like Richard Armitage. Well, many fans think he’s the second coming. Ah, the connections. They always warm my heart. Linnet Moss notices that Guylty’s RA Pocket Shrines are part of a world-wide tradition. Comments there, please. Many thanks for the reblog, Perry! Many thanks! I am a lifelong miniature obsessive–especially books, but also all other tiny things. I picked up a really cool little wooden carving of the Virgin Mary at the shrine at Monserrat in Spain. What I love about it is it’s very abstract, so it doesn’t scream catholic icon at you. It’s just a little piece of art. Oooh, I love the Montserrat virgin. She’s a very old one, 12th century or older. Also one of the so-called “Black Virgins” that were popular at the time. Personally I have a taste for the art that screams “Catholic Icon,” even though I am not Catholic and not even religious. But I study religion, so the folk element appeals to me. I can totally relate. I love the beauty of church /cathedral architecture despite not being religious. The actual black Madonna and child statue at the cathedral was stunning. So glad I made the trip up to Monserrat. I hope I can go someday. The natural environment around it looks stunning. I am all about miniatures, and talismans, and anything itty bitty with massive meaning. I store things in my pockets like a magpie collecting for its nest. The laundry is sadly always filled with my forgotten treasures – but they’re now washed and dried and super shiny if they make it through the cycles. Still, your pictures remind me of what a joyful and magical practice this is, and I’m inspired by some of the truly wondrous art. Many thanks for the pingback! Hi Carole, I’m afraid I don’t have the expertise to date your shrine. I wish I did! Someone needs to write a book on these little items, which hold great charm as collectibles and family heirlooms.